Are you Attending the National Rally? First and foremost, anyone that will be in attendance should be sure to visit our booth in the Main Vendor Building, Spaces 179-184. By simply providing us your email address, Bob’s will give you a gift in return…here’s a hint: it has wheels! Secondly, if your bike was modified, customized, refurbished, or restored (partly or completely) at Bob’s BMW or it was ‘thanks’ to Bob’s great inventory of parts and accessories that your bike is what it is today please contact us about displaying your bike in our booth. The plan is to rotate the display of bikes multiple times each day so we can share with the new rally-goers the endless possibilities there are with BMW’s and the ability to bring any model back to life. Interested? 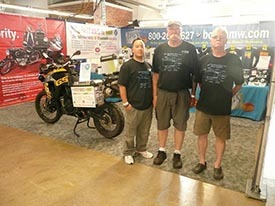 Email hanna.creekmore@bobsbmw.com with 2 good pictures of your bike (right and left), details of the work Bob’s has helped you with, your contact information including full name, phone number, email, and address, along with a short blurb on why your bike should be showcased in our display at this year’s MOA rally! And finally, if you missed the first and ONLY GG Taurus in the U.S. on display at Bob’s Open House, you will have another opportunity to be one of the first to see this 3-wheeled, BMW powered machine at Bob’s Booth at the rally!